The Allied Congress Party of Nigeria (ACPN) will officially flag off its presidential campaign on Monday, January 7, 2019 in the Federal Capital Territory. This was contained in a press statement issued on Sunday morning by the media team of the party’s presidential candidate, Dr. Obiageli Ezekwesili. According to the statement, supporters of the ACPN presidential candidate will also embark on a walk in seven states – Adamawa, Ebonyi, Edo, Kaduna, Kano and Kwara. The statement noted that the ACPN presidential candidate, Dr. Obiageli Ezekwesili, would flag off her #HOPE2019 campaign with her running mate, Abdulganiyu Galadima, at 12noon on January 7, 2019. The vision of the ACPN campaign is to mobilise citizens to displace the old political order and fix the age-long political leadership crisis of Nigeria. Her party, ACPN, takes its message of #Fight4Naija into the midst of people and mobilises citizens one-on-one and collectively to take the centre stage in the democratic process and actively use their voting power to effect a historical change in political leadership. Citizens are persuaded to only vote for candidates with the requisite character, competence and capacity necessary to provide good governance at all levels of elective offices. The statement read, “Consistent with ACPN’s citizens-centered approach, for the official flag-off, Ezekwesili and her running mate are leading their party faithfuls to Karu and Nyanya – suburb towns in the Federal Capital Territory. The venue of the political campaign is Cotland Garden in Karu, Abuja – located opposite the Emir’s palace in Karu. “The campaign will commence with a Citizens’ Panel session that will feature randomly selected participants across the demographics of children, young people, a woman and a man in a discussion on what kind of leader and government they want for Nigeria from the 2019 elections. The campaign flag-off will conclude with a #WalkforNaija, which will see the presidential candidate lead the audience in a street walk by citizens patterned after her trademark #WalkOfWomen. Simultaneously across the six states of Adamawa, Ebonyi, Edo, Kaduna, Kano and Kwara, volunteers will join Ezekwesili to walk their communities and engage fellow citizens in campaigning for votes. The symbolism of the volunteers’ walk in various states, cities, neighbourhoods and markets is to convey the decentralised design of the ACPN campaign. Through it, all citizens who wish to join in rescuing Nigeria from bad leadership can mobilise others and stage a campaign walk on behalf of the presidential candidate and her running mate, Galadima. 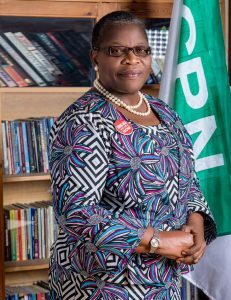 Ezekwesili co-founded Transparency International, an international Non-governmental Organisation that focuses on combating global corruption. As pioneer director of the organisation, she played a frontline role in creating the Corruption Perception Index, which is viewed as the most accurate measure of a country’s perceived level of corruption globally. On assumption of office as Minister of Education, there was a challenge of a mismatch between youth burgeoning, unemployability and limited economic opportunities. In responding to the challenge at that time, Ezekwesili ensured a major skills development programme was designed and a new level of certification introduced to Nigeria’s education system. There was also a design and addition of Vocational Enterprise Institutions (VEIs) and Innovation Enterprise Institutions (IEIs) as national certications accredited and regulated by the National Board for Technical Education. There are currently over 200 VEIs and IEIs, which are imparting skills in areas as diverse as cosmetology, welding, fashion design, electrical installation, para-legal studies, TV production, hospitality, among others. The post Citizens #WalkForNigeria as ACPN flags off campaign appeared first on INFORMATION NIGERIA.